NexusPro sealant is a long-lasting solution for repairing cracks in any concrete slab. Cracked concrete happens when part of a concrete slab breaks and sinks into underlying soil that has compressed or washed away. These cracks aren't just unsightly; they offer moisture a way to seep beneath the slab. This can cause the underlying soil to soften or even wash away completely. That in turn can cause the slab to crack further as it sinks into the void left by the washed-away soil. To prevent moisture from seeping into the soil beneath, those cracks need to be sealed, as do the control joints that were cut between the slabs when they were first poured. While you could seal them with urethane caulk found at your local big-box DIY store, that is a solution that is prone to cracking, bubbling and drying out over time. Which means you'll likely be sealing them again... and sooner than you thought. To request a free cost estimate to repair your cracked concrete slab, call us today at 1-844-385-7416 or click below to schedule an on-site inspection in Bozeman, Big Sky, Billings and nearby areas! Thankfully, fixing cracks in concrete has never been easier, thanks to a breakthrough in technology only available from Yellowstone Structural Systems and other concrete repair contractors in the Supportworks network. The NexusPro solution is installed by a highly trained crew that specializes in concrete repair and protection. First, the cracks are drilled, smoothed and prepared with non-absorbent backer rod filler. Then, the NexusPro sealant is inserted in the prepared crack or control joint. Finally, the cracks are detailed with a thin layer of native sand, giving the concrete a uniform, finished appearance. And, of course, sealed concrete cracks mean no unsightly weeds growing through. 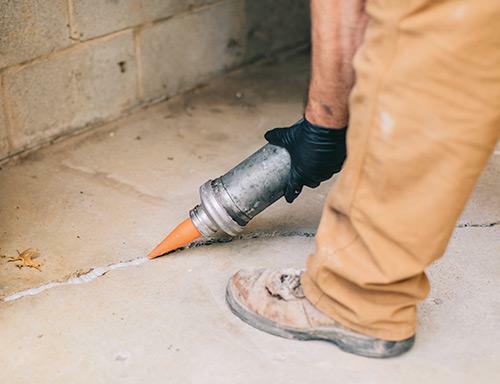 If you have cracked concrete in your home, the local experts at Yellowstone Structural Systems are here to help with solutions to seal your unprotected joints and cracked concrete. Contact us today for an on-site inspection and free cost estimate for concrete crack repair services in Bozeman, Big Sky, Billings, Belgrade, Great Falls, Helena, Butte, Missoula, Laurel, Livingston and the surrounding areas.